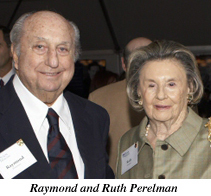 Raymond G. Perelman, W ’40, and his wife, Ruth, have pledged $25 million to name Penn Medicine’s Center for Advanced Medicine as The Raymond and Ruth Perelman Center for Advanced Medicine. This state-of-the-art facility—part of UPHS—will set a new standard for outpatient care in the specialty areas of cancer, cardiovascular medicine, and surgery. This beneficent gift, which continues a tradition of giving to Penn Medicine by the Perelmans, will help finance the construction and completion of The Raymond and Ruth Perelman Center for Advanced Medicine, which is expected to open its doors in 2008 with 300,000 square feet of clinical space. The Center will be at 34th Street and Civic Center Boulevard (Almanac October 25, 2005). Since 1992, Raymond Perelman has been president and chairman of the board of RGP Holdings, Inc., a privately held holding company comprised of a vast array of manufacturing, mining, and financial interests. Mr. Perelman serves as a Penn Medicine Trustee. Mr. and Mrs. Perelman are Trustees of the Raymond and Ruth Perelman Education Foundation, Inc.—which supports Jewish cultural and welfare organizations, as well as arts and history museums, and other cultural institutions. The Perelmans are parents of Jeffrey E. Perelman, W ’71, WG ’73, and Ronald O. Perelman, W ’64, WG ’66—who also have careers in business and philanthropy, and close ties to the city and the University.